The brand new trailer for what is sure to be one of the most talked about horror films of 2017 is finally here. "THE BELKO EXPERIMENT" hits theaters March 17, 2017. Written by the acclaimed writer/director James Gunn (Guardians of the Galaxy, Slither) and directed by Greg McLean (creator of the Wolf Creek franchise), "THE BELKO EXPERIMENT" is a terrifying, provocative and at times hilarious thrill-ride that literally provokes the question, what does it take to survive at work? 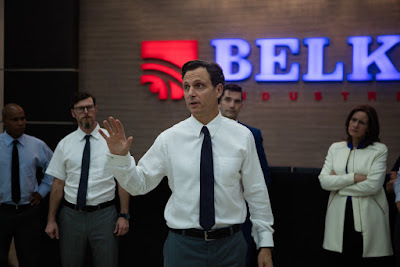 From Orion Pictures, "THE BELKO EXPERIMENT" stars John Gallagher Jr. (The Newsroom, 10 Cloverfield Lane), Tony Goldwyn (Scandal), John C. McGinley (Stan Against Evil, Scrubs), Adria Arjona (True Detective), Josh Brener (Silicon Valley) and Michael Rooker (Guardians of the Galaxy). The film was directed by Greg McLean and executive produced by James Gunn and Peter Safran (The Conjuring 1&2, Annabelle).